You are here: Home / News / The Truth Behind The Last Days Of The Irish War Of Independence. The Truth Behind The Last Days Of The Irish War Of Independence. 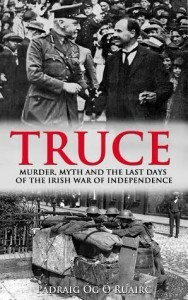 Truce – Murder, Myth and the last days of the Irish War of Independence investigates the popular myths and academic theories surrounding the fight for Irish independence that have been promoted by sections of the media and revisionist historians in Ireland. It exposes many of these as anti-republican propaganda stories invented by the British during the War of Independence and recycled by supporters of the Anglo – Irish Treaty during the Irish Civil War. Truce contains new research and information which challenges our current understanding of the War of Independence and the struggle for Irish freedom. It reveals the full truth about the shooting of Protestant “spies” by the IRA during the War of Independence. For the first time all of the 185 suspected British spies killed by the IRA during the War of Independence are named, including those who were “disappeared” and secretly buried by the rebels. Truce also reveals that the overwhelming majority of those killed as spies were Catholics and proves that the IRA’s intelligence war was not a cover for a sectarian campaign against Protestants as has been alleged by revisionist historians and controversialists in the Irish media such as Kevin Myers and Eoghan Harris. Truce solves for the first time the century old mystery of the “Ellis Quarry Killings” when four young, unarmed British soldiers were abducted by the IRA in Cork city and killed just hours before the ceasefire that ended the War of Independence. The identity of the killers is revealed and their motive is established. It also tells for the first time the story of a member of Cumann na mBan [the IRA womens auxiliary force] who was murdered in her home in Dublin by a British Army death squad just hours before the War of Independence ended. She was the only female rebel killed in the conflict and her story has never before been made public. The full story of Belfast’s Bloody Sunday (Sunday 10th July 1921) is examined in detail and attempts to find out whether the Belfast IRA or the infamous “B-Specials” were responsible for sparking this lethal violence. Truce – Murder, Myth and the last days of the Irish War of Independence is published by Mercier Press, and available nationwide. RRP €19.99.